This article originally appeared in Meatpaper Issue Thirteen. She got tips from her boss at Kobos Coffee, David Kobos, who keeps a large flock at his rural home in nearby Molalla and gives public lectures on the joys of raising chickens. Unlike Kobos, however, Rea doesn’t have a flock of 50 and the ability to expand it further. Like most urban dwellers, she is constrained by a city code that allows only a few chickens. In Portland, three is the maximum allowed without a special permit. When Lucky stopped laying eggs, Rea couldn’t bring herself to butcher her, even though that would have made room for another productive chicken. “They’ve been very easy pets to have,” she says. “It’s just heartbreaking when they get killed. I can’t imagine killing one myself, especially not to eat.” In that, she illustrates a new urban problem: People want to get closer to their food, but often that means getting closer to eggs, but not to meat — few want to eat an animal they know by name. When older hens stop laying, the owner runs out of eggs, which were the presumed point of having chickens in the first place. People want to get closer to their food, but often that means getting closer to eggs, but not to meat. Rea eats meat, and she acknowledges the paradox. “What right do I have to eat meat, if I’m not willing to butcher and process an animal? We’re so removed from what we eat.” But with packaged meat easily available at the grocery store, who would want to eat an animal they know by name? Chickens in production egg facilities rarely live to their second birthday, because their egg production slows beyond profitability before then. They begin laying eggs at approximately 20 weeks. Their production peaks six to ten weeks later, at which point they lay an egg almost every day. Production then declines for the rest of the hen’s life, with particular drops during winter and the annual molt. Precise production quantity and timing details vary by breed and, more important, by nutrition and living conditions. When commercial chickens are no longer profitable, they are slaughtered and replaced in the laying houses. Although chickens raised for eggs are different breeds than those raised for the breast and thigh meat found in your local grocery store, their meat does make it to market. They may end up in the chicken pot pie you grab from the freezer case, or in the food you buy for your (other) pets. Not all urban chicken keepers resist butchering their hens, though. Laura Dalton, the art studio manager at Reed college, tends a large, productive garden on her 7,000-square-foot lot in Portland’s St. Johns neighborhood. She grows asparagus, apples, blueberries, and a range of year-round vegetables. 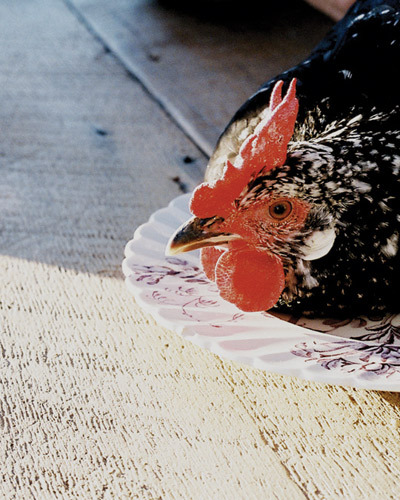 Similar to Rea, she wanted to be closer to her food, so she added chickens to the mix in 2007. Unlike many other chicken owners, she got really close. In the fall of 2009, egg production from her first hens declined significantly. Her husband, David Renner, asked and received her permission to butcher them while she was at work. He beheaded the first one with a hatchet, and the second one with a pair of garden loppers, which he reports are easier to handle for a one-person slaughter job. he has received so far regarding backyard slaughter have been about larger animals, such as goats and pigs, which make a lot more noise than a chicken. Yes, they do. But they don’t necessarily become your food. They might just become your pets. “I think it’s so American to get chickens for eggs and then keep them as pets, because you don’t have the chutzpah to eat them for dinner,” Dalton says. KASANDRA GRIFFIN’s attempts to raise chickens were thwarted by marauding raccoons and neighborhood dogs, but she remains obsessed with building a better coop and trying again. She has worked on environmental policy in Portland, Oregon since 1997, and is currently finishing a master’s in public policy at UC Berkeley with a focus on sustainable agriculture. JESSICA NIELLO is a painter and photographer living in Oakland, California. As a lover of chickens both as pets and as sandwiches, she is especially optimistic about contributing to this issue.